As the season's change, so do my love for colors. Last year I was crushing hard on burgundy & navy and this year my color of the moment seems to be hunter green. From interior design to fashion - I'm loving this color! When I saw the beautiful green nail polish color from Essie I got unnecessarily excited! We have one primary piece in our house that is even remotely close to this color & that's our couch - but I wouldn't mind a beautiful dresser or those suede heels - they could be a decor piece too right?! I'm seriously crushing on this Halogen dress that's on sale for under $50! Some other things making their way to my Fall wishlist is this amazing eyeliner in the color Jade and this Marc Jacobs watch - the strap is just so pretty! How do you feel about this color? 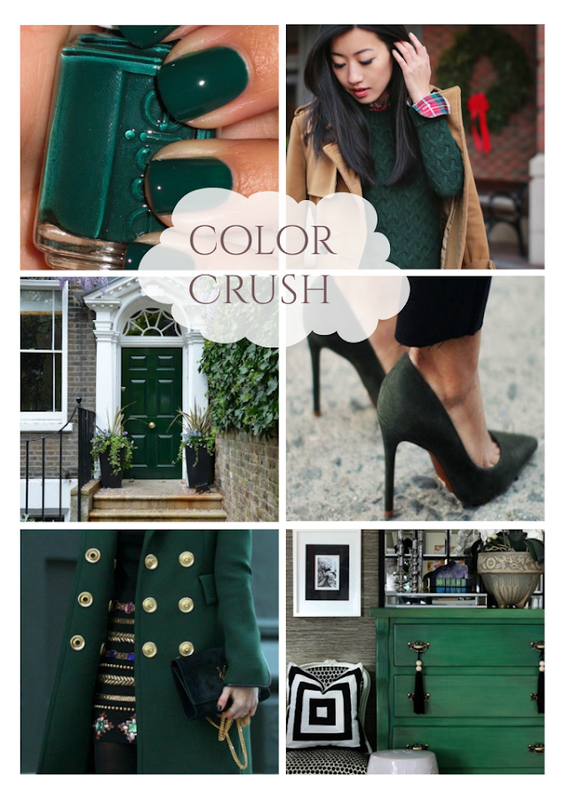 Any color your crushing on for Fall? Obsessed with hunter green for fall/winter! That nail polish is gorgeous and I think I need that last tunic top! I bet green eyeliner would be really pretty too, I might have to give that a try! Ahhhh, I LOVE this color, a,wats have! I used to have a hunter green couch years ago. Ha!! Nice choices sweet stuff!!! I'm seeing this color everywhere and I love it too!! Those heels and those hunter boots need to get in my closet! I love that skirt! It's too cute and a great length! I'm struggling with adding color to my new job- it's much more conservative than my last company. I think this green could fly though! I really want to add some hunter green to my wardrobe! Such a great color for fall! That watch is so cool and unique! And I love that hunter green is so dark because it feels like fall, but still gives that pop of color! This is totally my color crush too! Love all your picks, especially the saddle bag and the plaid skirt, so cute!! Love hunter green and those Hunter's will be mine this fall! Love your picks! When I was in middle school, my favorite color was Hunter Green and then I became obsessed with pink. I think I'll check out some Hunter this Fall!! I am not big on green but I have been crushing on Burgundy and deep violets. I'm really liking burgundy and olive this season. But I'm loving this color too! Especially the hunter green boots! I'm loving this color too! It's so much different than olive. I really need to get some pieces! Oh I'm totally in love with this hunter green! it's the perfect fall color! I need that nail polish ASAP! So pretty! ok i used to not be a fan but i am so coming around to this color! that whole first collage just makes me happy for fall. LOVE. that polish! swoon. need that in my life :) this color is def a great addition to the wardrobe! Hunter green is such a gorgeous color! I have a nail polish in a similar color that I wore last year and I think I might break it out already! I LOVE green! It is such a strong, lasting color and it really looks flattering on everyone. I have those Hunters in Hunter and they're my fave!! Hunter green is at the top of my radar, too! So pretty! I have black ones but I think I really need some hunter green wellies! Love all of your picks! I still can't get over burgundy-- it's like 90% of my closet right now, haha, but I looove this color green too! That Rebecca Minkoff bag is gorgeous!! I love that polish color, it will be perfect for Christmas. Also, confession on a Thursday, I listened to Christmas music yesterday, I'm not sure why, but I did. Growing up in the 90's when the three colors were navy, burgandy, and green, I thought I'd never see this color again. I was wrong. And I still love all three. Ooooo... that watch is gorgeous!!!!!!!!!!! And I love the nail polish, too. Deep jewel tones are awesome this time of year. Wouldn't you know we're crushing on the same color?!?!?!? I LOVE hunter and emerald green, so gorgeous in the fall. Oooh, this is my second favorite seasonal color after plum!! LOVE that nail polish! I'd never think to get it on my nails but looks like it'd be so cute! Gorrrrrgeous!! I'm loving the green! I just ordered some green goodies for little man because (I don't think) I can pull it off, so I'll let him do it. I'm totally that mom that lives vicariously through her kids, HA HA! I have not been around in blogland in a very (very) long time. However, this is one of the best posts to come back to. 1) Fall is my favorite season ever. 2) I never ever thought that I would like green, but this color is making me feel all warm and fuzzy inside. What a great color for fall!! I love all your picks! You have great taste. Now, if the weather could just get cooler so we could break out our falling clothing, I would be very happy. So pretty! I've been loving hunter and olive green, navy (always), and oxblood lately. Lots of jewel tones! LOVE hunter green! It is such a perfect color for fall and winter. I am totally drawn to hunter green right now too, which makes me super excited because I've always loved emerald green (my birthstone) and think hunter close enough =) Loving those heels and the Kendra Scott earrings! YES to hunter green! By the way, I was in Forever 21 yesterday and saw an exact dupe of that Valentino skirt - but for like $20, haha! I'm loving both hunger and army green for fall! Love all of your finds! Can't believe you featured this! Hunter green and Emerald green have been my favorite colors for YEARS!! Love them. I have green eyes and when I wear either of those colors my eyes "pop!!" I also have it in my home. FAVORITE nail color. LOOOOVE it! Hunter green is perfect for fall! Love that saddle bag and that checked skirt!! I have always loved green... all shades of it. I'm still on the hunt for a good military green jacket for fall. I love wearing dark green during autumn and winter, I love the Essie nailpolish! Amazing picks! This is such a gorgeous and elegant color that can be done so tastefully, those suede pumps are just adorable and can make their way into my closet whenever they feel like it :)! Love the green sweater and jacket. Although I think hunter green is too deep for my tastes, but it's such a gorgeous color. Love this color, so pretty! That wool coat and the heels, swoon! It looks so rich and cozy! Wow - who knew hunter green was so gorgeous! I'm usually all about the burgundy and navy, but clearly I need to expand my palette to include hunter! Thanks for sharing all of these pretties! I'm loving burgundy & hunter green this year! Yay for fall & fall colors! Those suede shoes could definitely be a decor piece...so gorgeous! Hunter green is such a good color and definitely one I would like to invest in. I'm thinking a chunky sweater like the one you pictured. Also, I think dark green liner would look amazing on you! Oh, hunter green, how I love thee. It will forever remind me of junior high because that shade was so popular back then. I remember rocking a pair of hunter green jeans and I thought that I was one bad mamma jamma. I'm glad to see it's making a comeback after all of these years! I am loving green too, maybe a shade lighter than the hunter. I am also really living a wine color! That nail polish certainly got my attention too, it looks really nice makes me appreciate the color green a little more. I would love to own the watch from Marc Jacobs. I never used to wear green, but then I started getting so many compliments when I wear it... It's now one of my got-to colors! Love it!! I think I'll always be crushing on navy and burgundy for this time of year, but I'm loving your inspiration board! A hunter green sweater with a camel coat looks gorgeous. I'm with you... it's a gorgeous color this season! I could totally use a hunter green coat. Except for that I live in south Florida!! Green is a go to color for me. And it's great to decorate with. Love that hunter dresser! I love this color! I really need to invest in some more clothes and accessories in this color! I have a essie color similar to this! Gorgeous! I love the Hunter boots and that chest. I am loving the dark green! I love this color for fall!! I fact I love this color in the winter and spring too. It's a nice 70° spring day here and I'm in a pair of hunter green pants I got from the Gap a few years ago!! ah, such a GOOD color. I just got a LuLaRoe pencil skirt in this color and I can't wait to wear it with some good boots! Love your picks especially that plaid skirt! That is totally something I could see myself sporting this Fall! I have been seeing hunter green and olive pop up everywhere this season! I got a shirt and a nail polish to be in the spirit but I'm reeeeeally loving burgundy these days. One of my favorite colors! I LOVE your picks! I am loving green too!!! Yes yes yes! I am 100% with you on hunter green. It's such a gorgeous hue and totally works like a neutral. I'm especially loving that MJ watch - so chic. That nail polish and those Kendra Scott earrings… I die. I'd never think of painting my nails that color but I LOVE it and definitely might try it this Fall! I love green esp. for the Fall. These are some really cute items! if you had told me 5 minutes ago i'd want a million hunter green things, i would have laughed. but now, i want all the hunter green things please. that sweater in the first inspiration picture.. swoon. I'm wearing Essie's Stylenomics on my toes right now actually :) I love this color for this time of year, and actually all through the winter too! I do love this green!!! I'm obsessed with navy too, but I am still searching for the perfect pieces!